The Guardian is running an advertising campaign featuring the Three Little Pigs to promote open journalism. 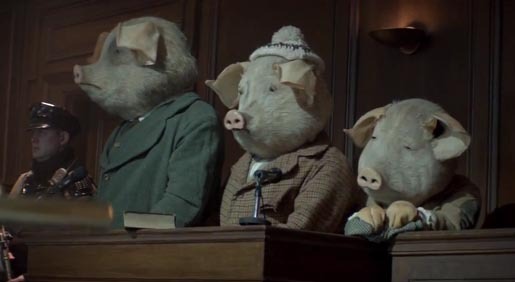 The commercial at the heart of the campaign imagines how The Guardian might cover the story of the three little pigs in print and online, from the paper’s front page headline, through a social media discussion and finally to an unexpected conclusion. See images from the campaign on the Guardian media gallery. The Three Little Pigs campaign was developed at BBH London by creative director David Kolbusz, creatives Matt Fitch and Mark Lewis, agency producer Davud Karbassioun, head of strategy Jason Gonsalves, production assistant Genevieve Sheppard, head of art Mark Reddy, print producer Sally Green, head of radio Sam Brock, team director Ngaio Pardon, team manager Alex Monger and team assistant Katie Burkes, working with The Guardian head of sales and marketing Richard Furness and marketing manager Anna Hayman. Filming was shot by director Ringan Ledwidge via Rattling Stick, London, with producer Chris Harrison and director of photography Franz Lustig. Editor was Rich Orrick at Work Post with assistant editor Ellie McNaughtan. Post production and visual effects were produce at The Mill, London, by producer Gemma Humphries, shoot supervisor/2D lead artist Gary Driver, shoot supervisor/3D lead artist Dave Fleet, 2D artist Adam Lambert, 3D artists Tom Bolt, Jonathan Wood, Adam Droy, Luke Tickner, Alberto Lara, Iker De Los Mozos, Natalie Rocks, Adam Darrah, assistant Zoe Cassey, motion graphics artist Ivo Sousa, colourist Mick Vincent, art director Adam Brandon and rotoscoping artist Robert Granger. Sound was designed by Will Cohen. Music was by Phil Kay at Woodwork Music.